In the words of our student Leaders. As our Sixth Form develops, so does our leadership programme. Sixth Form Future Leaders provides opportunities for Sixth Formers to take on leadership roles around the school that expand their skill sets in preparation for life beyond Haggerston. Sixth Form Future Leaders can be identified by their black and gold lanyards. Our Future Leaders have hosted visitors to the school during the annual Open House London event. They support Year 7 with their reading and have lead school tours for prospective students and their parents. In January 2017 two new initiatives began for Sixth Form Future Leaders. These are paid posts which allow Sixth Formers to work at lunchtime, after school and on Saturdays with students in Key Stages 3 and 4. They work alongside school staff , coaching , organising , refereeing and supporting in a range of sporting activities. The programme aims to increase participation in extracurricular sporting activities and encourage leadership skills in the Sixth Form students. Sixth Formers applying for these posts went through a rigorous selection process including an application statement and interview. We currently have 15 students on the programme. This initiative pairs Year 7 students with a Sixth Form partner. Year 7 students who would benefit from a role model to help them with transition are buddied with a trained future leader. They meet regularly and use a programme of questions to guide all professional conversations. This is overseen by the Head of Year 7. This is the most senior responsibility at Key Stage 4 in the school. Every September Year 11 students are selected by staff for this prestigious position. The students meet regularly with the Headteacher and act as a conduit between senior staff and students. The ambassadors have been involved in many areas of school life. They help run the Student Union. They have spoken to prospective parents at open evenings and have addressed parents at the Year 11 awards ceremony. They have taken part in staff interviews and regularly make themselves available to all students in order to feel they know what is happening “On the playground”. Most recently they have been in conversation with the Community Partnership Advisor for the City and Hackney Safeguarding Children Board, discussing safety in the local area. They successfully increased street lighting in one particular area of concern. 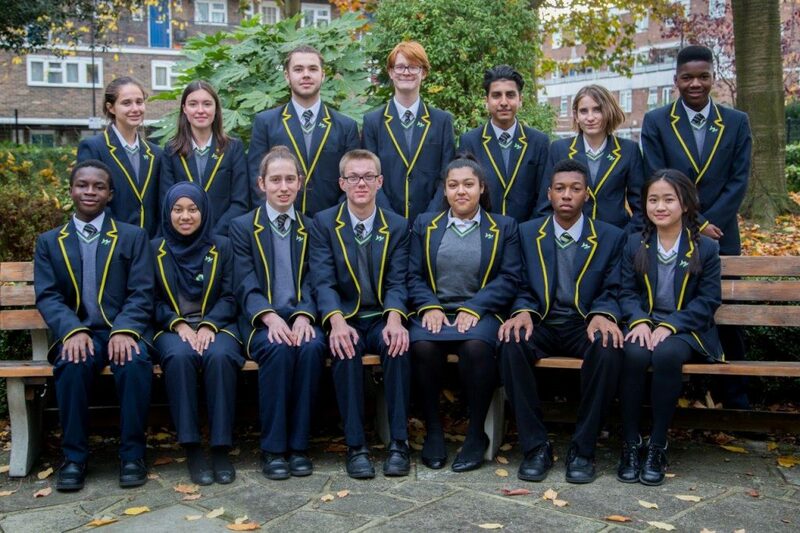 The Headteacher’s ambassadors can be identified by the distinctive gold trim on their blazers. The Year 10 seniors are a large group of Year 10 students (this year there are 60) who wanted to be involved in shaping the school. Any student in Year 10 can apply for a leadership role which involves filling in an application form and successfully completing a training course. Seniors will then be assigned to a member of staff and will have one responsibility only. The idea behind this is to ensure that Year 10’s main focus is their own progress. Currently seniors support learning in most areas of the school. They help run science, maths and English clubs, plan and deliver the Year 7 drama club, listen to younger students read and assist members of the leadership team . Seniors can be seen wearing a navy and gold tie (boys) or a green shirt (girls). The student union is a re-packaged and re-launched Haggerston version of what many might know as the student council. Five students from every year group, including all of the Headteacher’s Ambassadors form a total of 30 students that represent the voice of the whole school. As with seniors, students had to apply in writing for this position and successfully complete a training course. At Haggerston we believe time and effort needs to be spent in preparing for a responsibility as important as the student voice. The training enables students to feel confident about the unions’ purpose. We talked about being a role model both in and out of school. We have looked at different ways of collecting information and how listening to others is as important as speaking. So far, the student union has worked on the “Time capsule” project and has also researched healthy eating. Furthermore, it has advised staff on the best use of our school planners and has been consulted on issues surrounding homework. As with all role of responsibility the union members are recognisable by the green shield on their blazers. At Haggerston we take the transition from primary school to secondary school very seriously. We know how much work teachers and parents do in order to make the move as smooth as possible. In order to support Year 7 in their first term at school who better to offer guidance and support, if needed, than students who have been through the exact same experience only the year before. We call these year 8 student’s ‘buddies’. In the past they have written letters to the new Year 7’s in the summer before they started school. They have performed at the first assembly to parents, students and staff and they have also designed the buddy benches. Buddies wear a gold shield on their blazers. How Do I Get Involved In Student Leadership? Can you see yourself as a role model? Do you want to take an active role in your learning? Can you listen as well as speak? If the answer is YES look out for student leadership opportunities. They will be publicised in assembly and tutor time. The end of the summer term will be when we ask for applications for the student union, seniors and, buddies. We look forward to hearing from you.